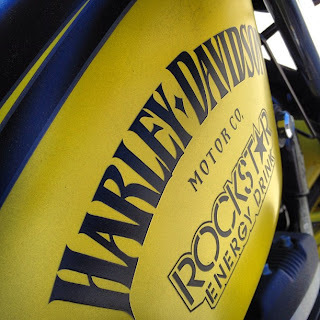 Milwaukee, Wis. – Harley-Davidson is enjoying freedom, self-expression and rebellion with Rockstar Energy Drink during its 110th Anniversary by celebrating around the world and in Milwaukee with Rockstar as the official energy drink of the Company's global anniversary events. Rockstar will take to the stages with Harley-Davidson at 110th Anniversary events in Sturgis and of course, in Milwaukee over Labor Day weekend 2013. Since the Harley-Davidson 110thAnniversary is a year-long, global celebration connecting millions of people united by a common bond, Rockstar and Harley-Davidson have partnered to create extraordinary experiences for fans throughout this monumental year. "Harley-Davidson riders and customers share the same kinds of rebellious ideals that live in a unique American brand like Rockstar Energy Drink," said John C. Farris, Jr., Harley-Davidson Director - Global Brand Alliances & Business Development. "Our 110th Anniversary gives people around the world the chance to share the freedom of the open road, enjoy Rockstar Energy Drink and maybe even win some cool custom motorcycles." 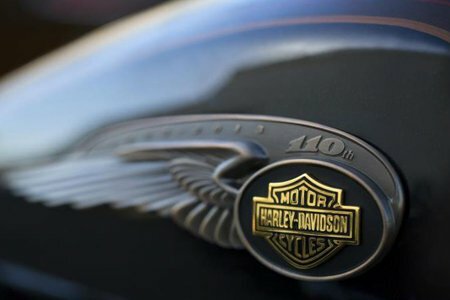 Rockstar and Harley-Davidson have worked together to create four custom bikes being displayed at 110th Anniversary events in Sturgis August 3-10 and in Milwaukee over Labor Day weekend. Fans have three opportunities to win one of the custom Rockstar Harley-Davidson motorcycles throughout the year, including one giveaway dedicated exclusively to Harley Owners Group (HOG) members. 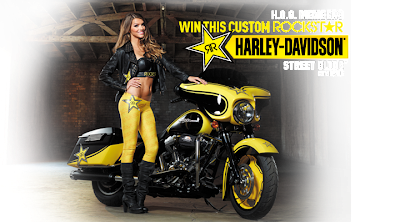 Rockstar custom Harley-Davidson Iron 883 where fans can enter now until July 31, 2013 http://harley.rockstarenergy.com/iron883. Rockstar custom Harley-Davidson Street Glide for Harley Owners Group (HOG) members until December 1, 2013 at http://harley.rockstarenergy.com/hog/. Rockstar custom Harley-Davidson Street Bob where fans can enter starting August 1, from August 1 to December 1, 2013 at http://Harley.rockstarenergy.com. To showcase the partnership and celebrate what being a rider is all about, Harley-Davidson and Rockstar have partnered on a video project, The Taste of Freedom Tour. The YouTube webseries follows five individuals from distinct backgrounds as they learn to ride and chronicles the experiences and the adventures they have along the way. Fans can follow their journey here: http://www.youtube.com/watch?v=cNjPrs9MtRw. About the Harley-Davidson 110th Anniversary Celebration The Harley-Davidson 110th Anniversary is a year-long, global celebration connecting millions of Harley-Davidson fans united by a common bond and shared passion for freedom, self-expression and epic adventure. Included in the official 110th Anniversary calendar are 12 different 110th Anniversary experiences that Harley-Davidson will bring to existing motorcycle events in global markets through September 2013. The events span 11 countries on six continents and are capped by two main celebration events in Rome, Italy, in June 2013 and Milwaukee during Labor Day weekend. Rockstar Energy Drink is designed for those who lead active lifestyles - from Athletes to Rockstars. Available in over 20 flavors at convenience and grocery outlets in over 30 countries, Rockstar supports the Rockstar lifestyle across the globe through Action Sports, Motor Sports, and Live Music. New from Rockstar for 2013, Rockstar Energy Water is a non-carbonated and sugar free enhanced water beverage that is now available throughout the U.S. in three refreshing flavors. For more information visit: www.RockstarEnergy.com; www.Facebook.com/Rockstar; www.Twitter.com/RockstarEnergy; www.Instagram.com/RockstarEnergy; www.YouTube.com/Rockstar.